Inspired by the Southern Foodways Alliance's"BBQ Oral Histories" of rural Tennessee (a must read if you are at all interested in regional BBQ and its differing approaches) and being told about the region's whole hog climate by John T Edge, I was extremely motivated to check it out on the heels of my recent excursion to the Skylight Inn in North Carolina. Rural middle Tennessee is more loyal to the Eastern Carolina tradition of barbeque than I've seen anywhere else in the country. Besides these loyalties to traditional Carolina methods, I am unaware of any other area in this country that has as many whole hog producing operations as western Tennessee. Even within North Carolina, no general region has as many. In fact, I believe it isn’t a stretch to say that this small area of Tennessee has more whole hog operators in existence than all of Eastern North Carolina. 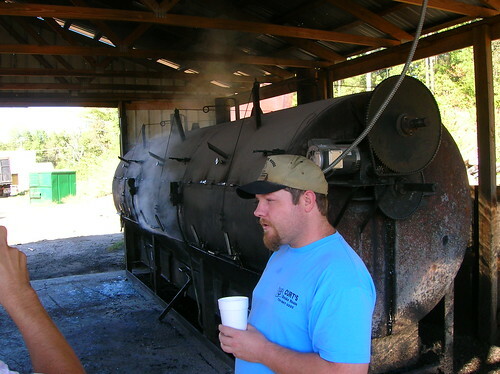 Most places here who cook whole hog BBQ use a Carolina style barbeque pit (like JeffB's) and will undoubtedly use hickory and/or oak which is burned down to coals. Also in the Carolina tradition, low and slow is an absolute given, with some places cooking at temperatures as low as 150 degrees for 12-14 hours and as long as 24. Like Eastern Carolina, a vinegar-based chili sauce is usually provided. Some, however, also serve up some sweeter style vinegar-based sauces. Since visiting, I can't help but wonder what linkage exists between this area's long settled residents to those of Eastern Carolina and its barbeque heritage in a historical context. I am happy to report that the whole hog barbeque tradition in western Tennessee, for now, is alive and well. Just after Mike “Parnelli Jones” Sula (M’Th’Su) nearly took out a bobcat on a highly wooded road leading to Centerville, we pulled up to Papa Kayjoe’s and were warmly greeted by the owner, Devin Pickard. Although Devin cooks up only shoulders, a virtual sin around these parts, I guess one can say that every so often the sum of the parts (shoulders) is more than the whole (hog): Kayjoe’s had some of the tastiest pork of the day being very moist and of the shredded variety. Like all other places we would visit throughout the day, only burned down wood to coals would be used. 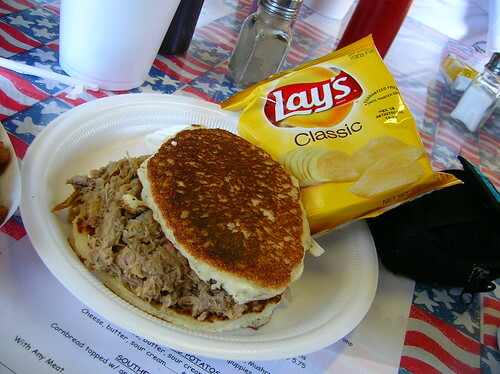 What made Papa Kayjoe’s special, though, was their pulled pork on a fried-in-lard corncake (hoecake) sandwich. This sandwich was a real crowd pleaser and a great way to start our barbeque day. This is my mental vision of what a country BBQ smokehouse should look like. Note the torched roof from either a grease fire or from the nearby burn down pit directly under the eave. 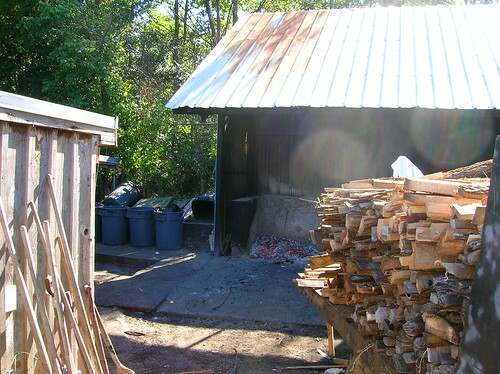 Grease fires are virtually unavoidable over time at country barbeque places like this where wood is constantly being burned down to coals and pits are fired continuously. For this reason as well as others (sanitation, cost, labor,etc. ), true wood burning barbeque country operations such as this might quickly become a thing of the past due to local fire regulations. Since barbeque has historically had an almost spiritual importance to most southern communities (often times with local churches having a “church barbeque” to raise funds for various community causes), fire and health regulations are rarely enforced. There’s something special about a place that, like days of yore, is still willing and able to fire up one whole hog at a time. One such gem is JD’s BBQ. Located at a rural crossroads and adjacent to a gas station, this matchbox of a BBQ joint has only one table and an order counter. Most of its functioning space is the attached pork pit out back. JD’s pork sandwich was of the coarsely chopped variety and though it was a bit on the dry side, the pork’s natural flavors and subtle smokiness showed that this was no casual effort. Their sauce was probably the best of the day. On Friday’s, Jeff Dill serves up a marinated pork chop sandwich which I found quite delectable. After proudly showing me his whole hog, he escorted me to the other side of his pit where he offered up the gratis pork chop. So glad he did. One whole hog at a time. Note the easily accessible fire extinguisher. It’s not too often one stumbles onto a relatively unknown place that makes you feel as though you’re literally in the aorta of the BBQ world. B.E Scott in Lexington, Tennessee is just such a place. All one has to do is see their pork pits, the large pickup truck loaded with wood next to their burn down pit, and eat in their modest yet well-seasoned dining room, to figure out that many other loyal patrons would wholeheartedly agree. With a steady stream of locals lining up to place their precious barbeque orders, you can see that this is a hugely important neighborhood eatery. Its diners are civil and silent, in the usual southern etiquette sort of way (composed, really) but for those eating this delicious barbeque, I swear from a distance, I could hear their internal grunts and groans of delight. Unlike the other places we visited, Scott’s barbeque came sliced, something you’re more apt to find in places like the North Carolina Piedmont region (Western) than the pulled or chopped variety from the Eastern part of the state. 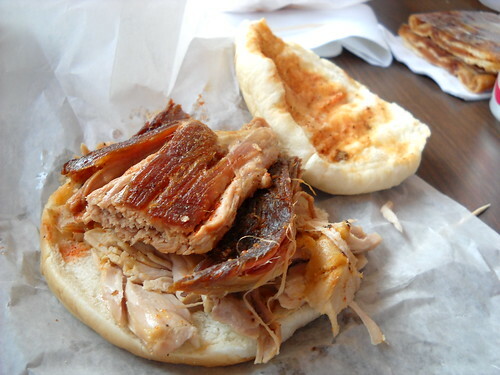 Like most quality pork made in the Carolina style, its smokiness sat in the background of its flavor profile and its porky goodness at the forefront. This is quality BBQ. Their baked beans are made with pig jowls, giving it unctuousness and flavor I've never experienced anywhere. We all agreed that this was a very special side. We also procured some ribs upon special request. Unlike ribs that you’d find in slab fashion in many other BBQ areas, ribs from a whole hog take on a stewed-like consistency. Though visually unappealing (when done right, like in the case of Scott’s), they are transcendental. Because Scott’s is off the well-beaten BBQ path, people may never make the extra effort to seek it out. But I can assure you that if you do, you won’t regret it. In my mind, it ranks up there as one of great BBQ places anywhere. A true thing of beauty: multiple whole hogs in traditional style Carolina pits. This photo shows only a portion of one of three pits at Scott’s. On this day, one of these pits was fully loaded and holding up to no less than 10 whole hogs. I’ve never been more pumped up in my BBQ travels as when I laid eyes on Scott’s whole hog smoking operation. I asked the on hand pitman, Parker the younger (son of owner, Ricky Parker), why they use multi-layers of card board moving boxes instead of the usual metal sheet cover. He claimed that they make a far better insulator. At first, all I could think about was the severe fires hazard it would create. But, indeed, they seemed to work like a charm. And they would certainly know. If you look closely next to the aluminum tray are the pig jowls. 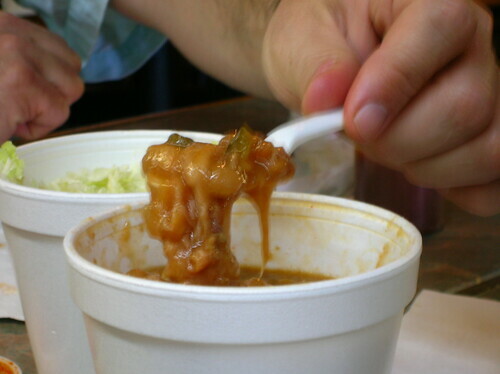 Since whole hog ribs stew within themselves for hours, they are naturally the fall-off-the-bone variety. Formerly Hays BBQ. Longtime owner, Dennis Hays, also owned the nearby slaughterhouse which supplies pigs for virtually every BBQ place in the region. Hays owned the only USDA approved slaughterhouse being used specifically by the many local barbeque establishments. He retired about 6 months ago and sold the restaurant portion of his Barbeque empire to Curt Blankenship, a former pitmaster at B.E Scott’s (for only about 9 months). The old Hays operation must have done some steep business evidenced by the sizable converted underground gas tank which has the capacity to cook several whole hogs at once. I suspect as many as 15 or so. Curt’s BBQ tasted old to me; like it had been reheated from the day before (or beyond). Even his sides tasted tired. It is possible that since we clearly were from out-of-town and didn’t ask for a specific part of the pig (shoulder, ribs, middling, or ham), they could have given us some unwanted leftovers. The pork had a gasoline element to it, something I believe happens to barbeque when it is overly exposed to smoke. It was a shame to have had such a sub-par experience (at least for that area!) at Curt’s after witnessing firsthand his true devotion to the whole hog tradition. But the fact was that this was definitely the low point of our barbeque day. 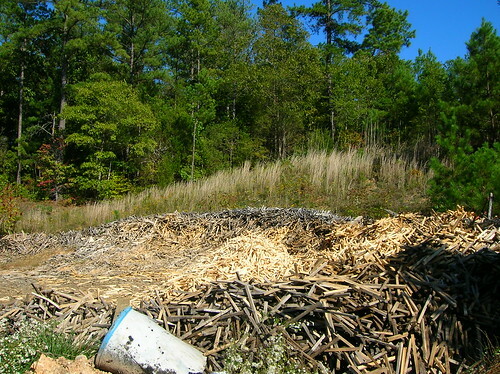 This field of wood used for coals is sourced from a local drumstick manufacturer who sells Curt their defective pieces. I believe JD BBQ in nearby Reagan uses them as well. This converted gas tank (that's Curt) was also used for years by Dennis Hays. It is a large scale electric rotisserie capable of holding several whole hogs at once. 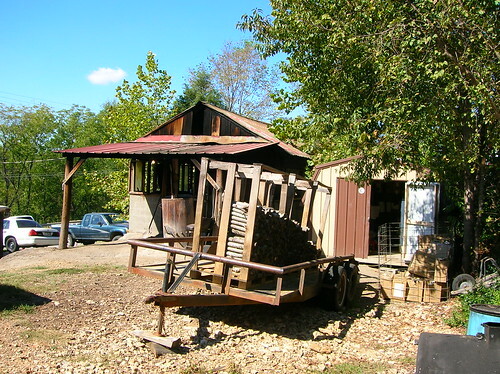 Even though it is electrical, wood coal is its sole fuel source. My respect for those pork makers who produce whole hog BBQ such as those found in western Tennessee cannot be overemphasized. They toil around the clock to make BBQ in a fashion they've known, loved, and respected their entire lives. Anything less than this way of doing things is taken as a personal insult to their cause. From burning down the wood to coals and repetitively loading the pits, to making sure that the pigs they’re working with are properly cooking hour after hour, in their minds this labor intensive effort is mandatory for producing true quality BBQ. If they didn’t have this strongly held belief, there’s no chance they would be willing to endure the long hours they put into their daily labor. Few people see the beauty of this world coupled with the will to work these long hours. 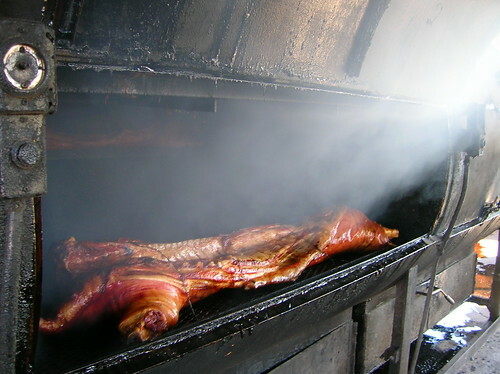 It is for this reason that whole hog barbeque is virtually a thing of the past except for a few, rare places in North Carolina and here in Middle Tennessee. Even today, where most other areas have completely stopped making whole hog, many customers as well as more than a few producers there still demand this time-tested and wonderful form of barbeque. My initial and reoccurring question after returning home from Eastern Carolina a few weeks back was about why this area still sustains an active whole hog tradition today while all of the traditionally whole hog producing southern regions are virtually void of it. I theorized that this area must have had a larger percentage of barbeque producing folk who migrated from various parts of Eastern Carolina compared to other similar frontier areas of the times. However, John T Edge wrote me this email saying “Eastern NC and Middle Tennessee are the whole hog capitals. They seem to be remnants of a time when whole hog was the norm. I think that's the key to the mystery: why did they retain something the rest of the entire region almost lost?” For some reason or another, this area’s whole hog tradition still thrives today whereas virtually every other traditional whole hog producing area have streamlined their methods, consequently making average or below forms of barbeque. 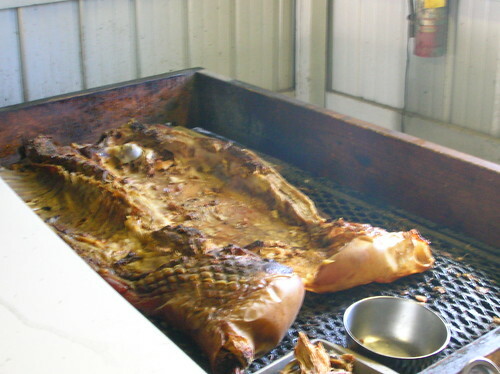 The whole hog barbeque region of western Tennessee, centered in and around Jackson is an absolute must road trip for anyone who has the slightest interest in barbeque, especially if the time tested method of whole hog preparation has any allure to you. Fortunately, this rapidly fleeting pig culture is still alive and well there. But like most other southern communities that once took pride in their whole hog culture, sadly someday it will most likely become a thing of the past. I had the fortune recently of being invited to my childhood second mother, Yolanda “Ma” Garces’ 75th surprise birthday party. While there, I spotted this beautiful photo of her in Old Cuba taken sometime around 1940. The migration of barbeque from places like this in the Caribbean to North Carolina/southern Virginia about 400 hundred years ago and ultimately making its way to such frontier places as Middle Tennessee always seemed to be on my mind throughout this incredible BBQ day. Last edited by PIGMON on November 12th, 2007, 7:52 am, edited 1 time in total. Wonderful report which has me sorely tempted to light out for the back country today... be hard to take the kids to that birthday party at 2 though. Wow, they have that many scrap drumsticks, enough to keep multiple BBQ places going? Who knew? Great story, great pix, great research and I'm sure, a great time had by all. Out of curiosity, do you know which drumstick maker supplied the wood, which I'd imagine to be hickory. I know of one prominent one making pepper mills and rolling pins as well, but they're in the NE. The places mentioned are approximately 30 miles EAST of Jackson, TN. 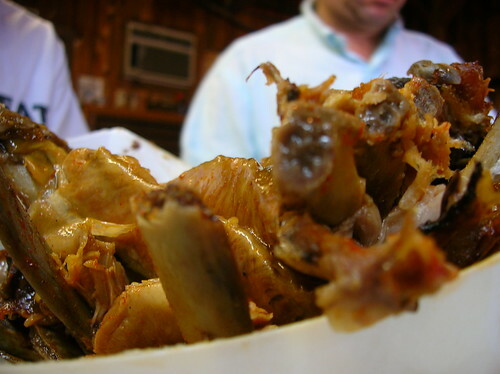 In addition to some great BBQ places, the area is well known for its catfish ponds and catfish joints. I spend about two months in Humboldt, TN fifteen years ago and remembered the almost nightly catfish dinners (but not the names of the places. Thanks, PIGMON, I learned a lot. Best of all, I could almost taste those whole hogs. Great reading! Thanks PIGMON! I live just north of Jackson and just outside Humboldt (moved in March). I've not yet made it to the Lexington places you mentioned. The food scene in central west TN is being taken over by chains. The mom and pop shops are slowly closing down. the BBQ places have a pretty loyal following and do a pretty decent business. We're doing our best to support the little guys. Thanks for adding to my list! Great stuff as always. Looking at your post reminds me a lot of my time in and around Clarksville and Murfreesboro TN when I was a little kid. I think I've mentioned before that the neighbors all raised a few hogs each year for hams. The local BBQ shack was tremendous, and what wasn't turned into country ham or sausage went to the BBQ. At the time, it was common for the BBQ places to accept shoulders or hogs to cook for you. Wonder if any of the places you documented offer that service. I also remember walking through the woods and finding smokehouses and tobacco drying barns that seemed too perfectly rusticated to be real. Like the witch's house in Hansel and Gretel, but infinitely better-smelling. The local shacks looked very much like Papa Kayjoe’s. I figured there was no such thing anymore, if there ever was. Thanks for the photographic evidence. I agree with you about the state of BBQ in general and the special place that middle TN is for traditional 'cue. Earlier this year, I met friends down in Manchester TN (a bit out of the area) for the Bonnaroo music fest. Most of the food was pretty bad, generic carnival crap and/or tasteless vegan fake meat. But one day the food in the old-people (aka VIP) tents was catered pulled pork from the local BBQ. Man. One can eat a lot of BBQ under certain circumstances. It's a beautiful part of the country, and the BBQ helps. Add in grits, country ham biscuits, and catfish, and you don't need much else. Last, great picture of the lechon in Cuba! 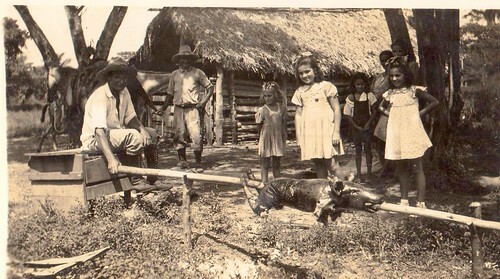 What an image, with the guajiro turning the pig, a bohio in the background, and scrubbed little girls looking on. The cook was wise to hide his bottle of rum for the picture. The Southern whole hog tradition and the Cuban whole hog tradition are in many ways the same tradition. Especially in certain parts of Florida and in my back yard. Thanks for a great post. I too was inspired by the Southern Foodways oral history a couple of years ago and drove from my mom's house in Murray, KY to have lunch at Scott's in Lexington. The 200 mile roundtrip into Tennessee was well worth it as it was some of the best BBQ I've eaten. The day I was there the staff was excited about being mentioned in an upcoming Bon Appetit. I always looked for it but never saw anything about Scott's. It has been a couple of years so I could have missed an issue. Has anyone else seen this mention of Scott's? When can we start purchasing tickets for "Pigmon's BBQ Bus Tour"? Great stuff, Rob, thanks. Back when I first read that terrific SFA series I just wanted to jump in my car and head down there before all of these old-school places disappeared. Now I want to go even more! I know the focus was on the Q but at a number of these places there's always some type of house-made dessert as well that people save room for. Any experiences to report there? I recall the interview with Dennis Hays had him describing a number of house made items his wife made but I guess with the sale to Curt that's gone, or at least sourced differently. Shame that your experience there was so negative, let's hope it's a one-off. This post made me woozy with pork lust. Another fine example of eating pig from the rooty to the tooty. It's taken me four days to recover from the swine-loving high you've inspired. Excellent field reporting and stunning photographs. Thank you for sharing. PIGMON wrote: makes you feel as though you’re literally in the aorta of the BBQ world. I've read Middle Tennessee multiple times and each I spin into the most pleasant of whole hog daydreams. PIGMON wrote: A true thing of beauty: multiple whole hogs in traditional style Carolina pits. This photo shows only a portion of one of three pits at Scott’s. On this day, one of these pits was fully loaded and holding up to no less than 10 whole hogs. I’ve never been more pumped up in my BBQ travels as when I laid eyes on Scott’s whole hog smoking operation. I asked the on hand pitman, Parker the younger (son of owner, Ricky Parker), why they use multi-layers of card board moving boxes instead of the usual metal sheet cover. He claimed that they make a far better insulator. At first, all I could think about was the severe fires hazard it would create. But, indeed, they seemed to work like a charm. And they would certainly know. Cardboard sheets are an interesting innovation, but I wonder about Parker's statement about them being a better insulator. I'm not disputing the word of an experienced pitman, of course, but it seems as though the cardboard layers (permitting more airflow?) would not get as hot as a metal sheet, and so would be not only easier to handle but less likely to become reflective heat "sources" themselves and thus speed up the cooking process. David Hammond wrote: Cardboard sheets are an interesting innovation, but I wonder about Parker's statement about them being a better insulator. I'm not disputing the word of an experienced pitman, of course, but it seems as though the cardboard layers (permitting more airflow?) would not get as hot as a metal sheet, and so would be not only easier to handle but less likely to become reflective heat "sources" themselves and thus speed up the cooking process. Thin metal sheets seem as if they would cool down faster than layers of cardboard, but I couldn't find any high school science projects to back me up. That said, I've cooked whole hog with both cardboard and metal as lids and prefer metal. Which is no in way disagreeing with Parker as he cooks more pigs in a week than I have total. As an aside, one does not want a BBQ pit air tight, which tends to choke off the fire and lead to smoldering. I went here when I was in the Philippines. Imagine if we had this were in Chicago! Besides the steady destruction of the spectacular fringing coral reefs in and around Sharm-el-Sheik (southern tip of the Sinai peninsula) over the past 25 years, I am hard pressed to think of another situation I find more disturbing than the recent collapse of virtually all whole hog BBQ operations in middle Tennessee. Since my last visit in the fall of 2007, Curt’s BBQ (mentioned upthread) has changed hands and is now called The Smoke House (Lexington). Manager Debbie Smith claims that they haven’t been doing whole hog since the recent closing of the local slaughterhouse (the old Hayes operation) and hopes to start up whole hog production again sometime soon. Somehow, though, I got the clear sense that that was only their company line. Siler’s Old Time BBQ (Henderson) pitmaster Ronnie Hampton told me that after 8 years of cooking whole hog, they’re going straight parts from now on, and he was none too happy about that. Jeff Dill, owner & pitmaster at JD’s BBQ Barn (Reagan) reiterated the same thing as well. Besides the BBQ whole hog Mecca of the region known as Scott Parker (formerly B.E. Scott’s), no one I talked to who historically cooks whole hog barbeque is even thinking of doing so in the future after the recent closing the primary local slaughterhouse. Scott Parker has an exclusive contract with a private operation (412 West slaughterhouse located just outside Lexington) because of the large number of hogs they will religiously procure. In the area, no one touches their volume. Another dagger in the world of authentic BBQ. Skinny Rob and I hit 10 BBQ places in 36 hours; 7 in and around Henderson County in middle Tennessee (with a double-stop at Scott Parker) and 3 (Payne’s, Cozy Corner, and Morris Grocery) in the Memphis area. On our initial visit to Scott Parker BBQ (Lexington, TN), we both tried a middlin’ sandwich, a gastronomic delight usually derived from meat coming from side pork. The leanness of this meat was surprisingly succulent and juicy, which I find remarkable since meat that usually looks like this did would be dry and flavorless. This white meat had texture and integrity with a pleasant resistance to its chew; something I haven’t experience anywhere else in the barbeque world. I can only chalk this up to the cooking an entire whole hog where it literally stews in its own juices, something that is hard to replicate when only using parts. After having one of these luscious marvels and spending a lot of time thinking about it throughout the rest of the day, Skinny and I both agreed that a return visit to sample a few more sandwiches from other parts of the pig was mandatory. If you don’t understand or are not familiar with why some swear by whole hog and its greatness, all ones needs to do is try the various parts of a properly made whole pig. We started off the next day there with an outside-brown shoulder sammy. Even though the outside “bark” was a bit dried out and jerky-esque, it was surprisingly tasty. 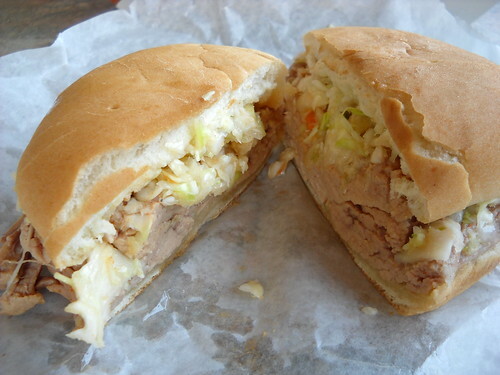 The inside brown meat gave the overall sandwich a moist, ultra-rich porky dimension to it that contrasted brilliantly with the outside crust. 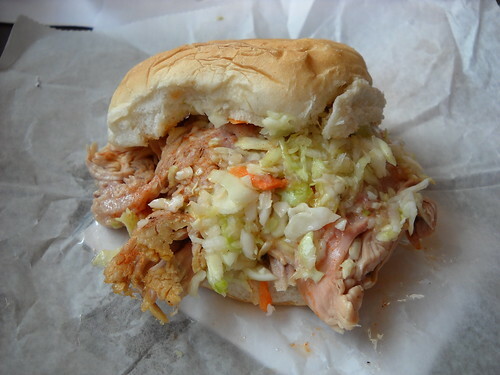 Although I do prefer Scott’s excellent semi-sweet, relish-less slaw on any of their sandwiches (it creates a nice contrast to the subtle saltiness of their pork), this particular effort was still exceptional. We then followed that up with a sandwich constructed strictly from the fatty inside shoulder. This thing was a true work of art! The bold pork flavor, coupled with varying gradations of textures, and being saturated with magnificent juiciness made this effort the best of the three. Barring the barbeque shoulder masterpieces being produced over at the Morris’ Grocery (Eads, TN), it is unparalleled anywhere in the entire South…as far as I know. Trying three distinct sandwiches made from varying meats derived from the whole hog was an eye-opening experience. Any one of these sandwiches had a strong ability to convert any self-respecting barbeque lover to the beauty of a properly made whole hog sandwich. Too bad this type of culinary experience is a breath away from being a thing of the past.